On the information about how to do a mite check please note the change: Put the jar of bees in the sun, the heat helps to release the grip of the mite so that a more accurate count can be gained. This weekend (5/16/2015) Bill Catherall, President of PUB, will lead the class. The subject will be treatment-free beekeeping. If you are interested in treatment-free beekeeping you will not want to miss the opportunity to learn from Bill who is very knowledgeable about bee biology and treatment-free beekeeping. Its a great opportunity to ask your questions and get hands on training. I do apologize for the lateness of this letter. As many of us know life catches up with us and sweeps us away. It probably means we are having a good time in the process of living. At least I hope it is that way for everyone. It is certainly that way for me. Next month I am graduating from Antioch University, and technically the “Capstone Project” or, “Change Project” is officially over. What does this mean for Zenger Farm Apiary and ZFAC? Nothing, except for future blogs about the project that Zenger Farm, PUB and ZFAC took part in, don’t worry if I seem to be clear as mud. Just know blogs will be coming forth that will reveal all in the near future. As it stands, nothing will change and Bee Learning will continue to happen every first and third Saturday. 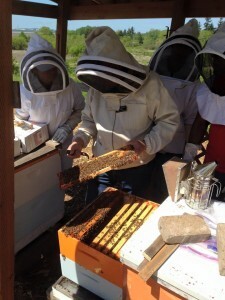 The last time we were at the Farm we had Dr. Dewey Caron teach us about basic Queen rearing. It was a really great day and I think we all learned a lot. I know I did. Please look for the short video that can be found on Facebook under the Zenger Community Bee Project. June we will talk about problem hives. How we can fix, manage or solve problems. Most of the hives are thriving. Please note that the TOP BAR KENYAN is not a very strong hive. We politely ask people not go into it or open the window at this time. We have tightened their space with a false wall to help them keep the brood warm. We are still trying to figure out why the bees are not thriving like they should, we will check the Kenyan in June to see how far they have come. Hive four is also not doing as well as should be expected. The brood pattern is not great and I am chalking it up to the queen, however, I have made the mistake of jumping to the conclusion that is a failing queen, when in fact she just had not started to get her groove on. When she did, she was doing great. I am hoping that this queen will get her groove on and get on with laying. We will also be checking this one in June. We have a lot of hives that are thriving and growing. Soon we will be putting honey supers on and tasting the sweet taste of summer. I am really excited about this. We also have a lot more land to play with that is not completely grass ridden. Thank you again Comcast and fellow workers who gave up their Saturdays for our comfort today. We continue to learn new things from one another and a lot of collaboration occurs between beekeepers. I am really proud of the ZFAC community that continues to grow as we continue to learn. We need a work party. We need nucleus hive boxes, or old queen castles. Please email me direct or message me on Facebook. If you have a donation please make prior arrangements with me directly. We are part of Zenger Farm because they offer us space, nevertheless, we are also separate from Zenger Farm. Many workers do not know where to put our stuff, because we do not at this time have a designated space. We hope to change this in the near future, until then, please contact me directly at the PUB meeting, or on Facebook. Why does my hive look the way it does? If you just put in a nucleus hive (five frame) and put them in a box without comb, expect that it will take longer than if you had already prepared comb available. The hives are still growing or they are exploding depending on the location. If they are not doing so well, then call upon a mentor to take a look. The response can vary depending on the situation and its difficult to give a response without seeing what is going on in the hive itself. This response is directed more towards the medium to high growth rates. Responses: Split if your bees are exploding, or add another deep, medium, or shallow. If they are growing wait and be patient. Your hive is growing. Why does my comb look white and other people’s comb look black? White comb is brand new comb and black comb is a few seasons to years old. Comb gets darker and darker as it ages. Some beekeepers like to change out old comb, others continue to use it. It is up to you as a beekeeper what you would like to do. Just remember this, it takes time and effort on the bees part to draw comb. If it is already made they can do what they do without the fuss of making it. To requeen or not to requeen? That is the question. If your brood is spotty and the eggs are sporadic then its possible you might need to requeen. Please note that it might take new queens a little time before they get their groove on, patience is a virtue and less can sometimes be more. If you feel you don’t have a queen. As my trusted friends and I have learned. Look, look, look again. Not always is the queen visible when we try to find her. Queens can move very quickly. One tip: Separate the top and bottom box from each other and check in the boxes individually, that way the queen is in the top OR the bottom. If you decide you need to requeen you don’t have to kill her. I got great advice last night. Paul Maresh the chair of the Cascadia Queen Breeders shared with me this, and I just have to pass it on, “Put the old queen in a nucleus box and have her strengthen a nuc.” I hope this gives you an “aha” like it did for me last night. I continue to learn things all the time. Isn’t a great community? I just love beekeeping and beekeepers! There are more reasons then what is just mentioned here. Don’t forget to read books to go deeper in the knowledge of beekeeping. A special thank you to those who contributed to this weeks questions.